Congenital pneumonia (transplacentally acquired), e.g. rubella, cytomegalovirus, toxoplasma, listeria, herpes simplex, Treponema pallidum. 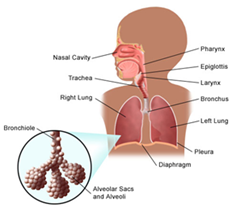 Late-onset pneumonia (due to organisms acquired nascomially (“horizontally”) or in the community. Microbes involved are group B betahaemolytic streptococcus (GBS), pneumococcus and coliforms. Late-onset pneumonia occurs at least 48 hours after delivery and later. Presents more insidiously and may develop abdominal distension and feeding intolerance. Microbes involved are streptococci, staphylococci, E.coli, Klebsiella. Viral and chlamydial infections are also associated with pneumonia. Chlamydial pneumonia usually presents between 4 and 11 weeks of age (and earlier) with tachypnoea, apnoea, nasal congestion, paroxysmal and staccato cough and crepitations.